My Garlic is ready to harvest. Re: My Garlic is ready to harvest. Gary350 wrote: When I plant my garlic I push the cloves into to the soil just deep enough that the top end of the clove is flush with the soil surface. I don't even cover them up with soil. I spray them with the water hose this washes the soil up against the cloves. Once the cloves take root the plants are permanently anchored in place. 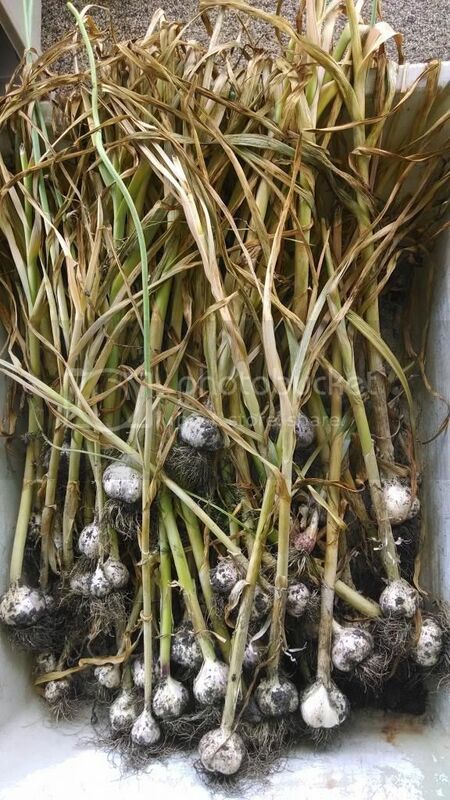 As the garlic grows larger they grow themselves out of the ground. When my garlic is finished about 1/2 of the garlic head is above the soil. When I lived in TN my garlic was never larger than a ping pong ball. The soil was hard as cement when it was dry and I was planting the cloves too deep. I think a bag of child play sand mixed with 10% soil would be perfect for growing garlic and onions. I use to buy fish aquariums very cheap at yard sales. I use to plant all types of seeds under a fish aquarium then turn the fish aquarium upside down over the seeds. It was very strange to look out side in the middle of winter with 6" of snow on the ground and the fish aquariums were green with plants. Onions, garlic, beets, carrots, lettuce, herbs, Spanish, peas, turnip greens, etc. Even when the temperature got down to 15 degrees many of the plants were fine. During the day the aquariums were mini green houses. I use to lift one end of the aquarium, tip it back and harvest a few things for dinner. Then put the aquarium back down again. That was about 1980 when I was still young and had lots of energy. Gary350 wrote: I use to buy fish aquariums very cheap at yard sales. I use to plant all types of seeds under a fish aquarium then turn the fish aquarium upside down over the seeds. It was very strange to look out side in the middle of winter with 6" of snow on the ground and the fish aquariums were green with plants. Onions, garlic, beets, carrots, lettuce, herbs, Spanish, peas, turnip greens, etc. Even when the temperature got down to 15 degrees many of the plants were fine. During the day the aquariums were mini green houses. I use to lift one end of the aquarium, tip it back and harvest a few things for dinner. Then put the aquarium back down again. That was about 1980 when I was still young and had lots of energy. Hey good idea! I used to keep snakes and lizards and I think I still have some large aquariums. I am going to have to check. Be very careful, an unvented glass box like that can quickly fry your plants on a sunny day. SOB wrote: Great looking garlic! The tips of my garlic leaves just started turning yellow so being curious I pulled one from the ground. I plant almost 300 heads so pulling one early wasn't that big of a deal. Well, little did I know that the head would be so huge! This is the 3rd year I've grown garlic and it keeps getting better each year. I really think selecting the biggest cloves from the previous year and planting those make a world of difference. Once question - until now I had always dug them out of the ground. I was always afraid that pulling them would leave me with a stem and no garlic but pulling up this "test" head it turned out pretty good. Digging them out I was always left with a big ball of mud (mostly clay around here) stuck to the head but when I pulled this one it came out nice and clean. How do you all typically do it...carefully pull them or dig? I saw a couple responses above that make it sound like some pull them. If so I think I might give it a try this year. I use a potato fork to just break up the soil around them and just left them out by the stem. Never had one break off yet. Mine turned out just about what it did last year some are a bit smaller I am blaming the very harsh winter and cold spring we had. How do I know when my turnips are ready for harvest? Is the Pumpkin Ready to Harvest?